We're celebrating the Complete Wi-Fi Guarantee from BT – the only internet provider to guarantee a wi-fi signal in every room. This week, we're giving you the chance to win some incredible tech for the family. You could win a Samsung Galaxy Tablet and a Sonos Wireless Speaker. It's thanks to the BT Complete WI-FI Guarantee, which helps keep your family connected. 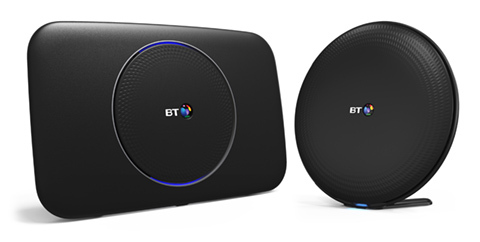 BT's Wi-Fi Discs extend the signal from your Smart Hub to give you coverage from the basement to the attic. So you can facetime from the bedroom, relax with a movie in the bath, and stream Heart in the kitchen. You'll also get faster wi-fi speeds, so you should be able to stream HD content anywhere in your home. A 4-bedroom home could see an increase in wi-fi speeds of up to 25% with just one Wi-Fi Disc. Click below to find out more about the BT Complete Wi-Fi Guarantee. In the unlikely event your broadband stops working, as a Plus customer, they'll get you back online as quickly as they can with their Keep Connected Promise. If you tell them something's wrong, they'll rescue you from an internet disaster by sending you a Mini Hub straight away – at no extra cost. It uses a 4G mobile signal to connect your devices until the fault is fixed. And if you've got mobile with them, they'll switch on free unlimited data, on all your phones with them within an hour of you reporting the fault. Click below to find out more about the Keep Connected Promise.